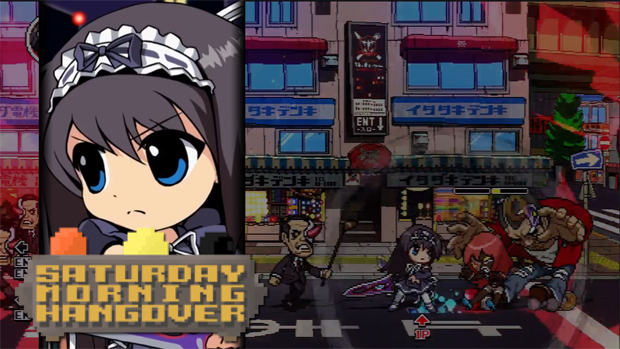 We had a delightful little Saturday Morning Hangover this morning, playing the recently released Phantom Breaker: Battle Grounds. Jordan, Katrina and I all piled on in this one and found it to be an enjoyable beat-em-up, if a bit demanding and technical. Also, Katrina is deceptively good at fighting games, something I would do well to remember in the future. The week's Xbox Live Indie demos were also played, though there wasn't really anything too exciting, other than a match-3 game, Candies vs. Hypnodeer that amused Jordan for a good bit. I was interested in Chromathud (and may yet give that another go), and you'll be astounded by the revelation which is Break. Totally. All this, plus another trip down the glorious Rabbid hole that is the Dafoeverse for more of your homages to the greatest actor living today, including an incredibly meta drawing of our show surfing the Dafoeverse. It's like staring into infinity and finding it full of spiders!